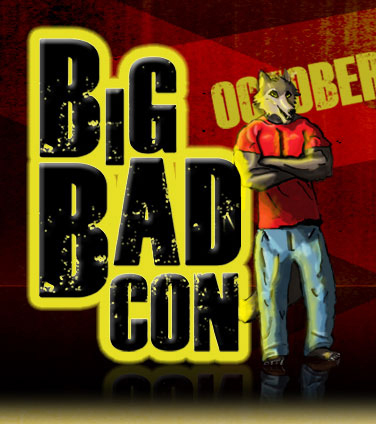 Problem: There aren’t enough good weekend long RPG conventions in the Bay Area. My Answer: Big Bad Con! I’ve talked to Japji Khalsa (of Kublacon), Chris Hanrahan (EndGame in Oakland), Doug Daulton (of Neoncon), Matt Steele (of Dead of Winter), and Ryan Macklin (of Go Play SF Bay and The Internet). I’m put all the ideas from these great minds together to create one awesome con. Big Bad GM – 4 GMs compete in a zero prep game with three secret ingredients given to them…the moment the games stats! Imperial Academy Dropouts: The Big Bad’s own nerd cord band rocked out with tunes like Convention Lover and of course Hungry like the Wolf. Over 70 Indie/Small Press games on the roster. Big Bad is the west coast indie con! So when is BBC 2015? I would like to know ASAP to submit my vacation request at work. Hi Antnio. We don’t know yet for sure. Most likely Oct 16-18 but I haven’t been able to sign a contract with the hotel yet. Still waiting on them to approve it. I’ll post as soon as I know.